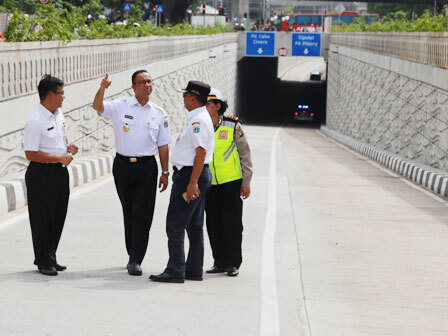 Jakarta Governor, Anies Baswedan, inaugurated the operation of Kartini Underpass, South Jakarta, Wednesday (2/28).
" This is the hallmark of Betawi culture in every project design in Jakarta"
He appreciated the use of ornaments typical Betawi, Gigi Balang, on the planter box of the underpass. This concept would also be applied for infrastructure development around Jalan Jenderal Sudirman and Jalan MH Thamrin. "This is the hallmark of Betawi culture in every project design in Jakarta," he stated, at the inauguration site. He hoped the underpass could parse traffic jam in Lebak Bulus and Pondok Indah areas. "It will be very useful to reduce the volume of vehicles," he stated. Meanwhile, Jakarta Bina Marga Dept. Head, Yusmada Faizal added, the use of ornaments type Betawi culture is a form of appreciation of local wisdom. Moreover, there has been Bylaw No. 4/2015 on Betawi Cultural Preservation and Gubernatorial Regulation No. 11/2017 on Betawi Culture icon. "We're committed to participate in preserving Betawi culture," he stated. As for the information, the Kartini Underpass is developed on March 9, 2017. While the open traffic trial is applied on February 22, 2018.